Neu5Gc is a major mammalian sialic acid synthesized from Neu5Ac by an enzyme that is no longer present in humans. Regardless, nonhuman, diet-derived Neu5Gc is metabolically integrated into a variety of human tissues. Human cells can biochemically recognize Neu5Gc and incorporate it into cell-surface glycoconjugates, however the immune system recognizes Neu5Gc-containing glycans as alien and produces anti-Neu5Gc antibodies resulting in inflammation. Diseases relating to chronic inflammation such as cancer, cardiovascular diseases, and thyroiditis are associated with higher levels of anti-Neu5Gc and Neu5Gc, and it is suspected to be involved in other diseases that are exacerbated by a red meat, Neu5Gc-rich diet. 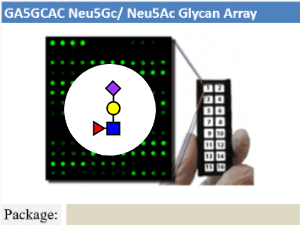 The Neu5Gc microarray represents a broad range of N-glycans found on cell surfaces that have incorporated Neu5Gc. 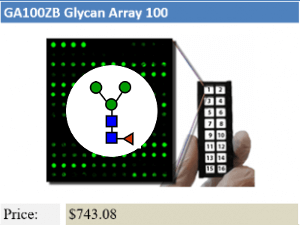 These arrays can be investigated with glycan-binding proteins, antibodies, or cells in order to determine their specific interaction with this Neu5Gc xenoantigen. 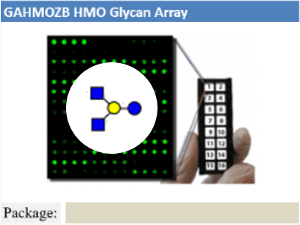 For comparison, each array includes the precursory, non-xenogenic Neu5Ac sialic acid form of each glycan. Example 2: A subarray assayed with glycan-binding protein biotinylated WGA lectin, followed by streptavidin-Cy3 conjugate. 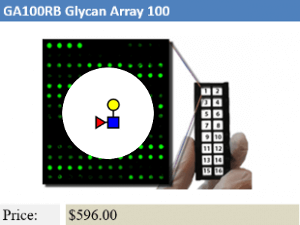 Array was scanned with a GenePix scanner at 450 PMT and 100% laser power at 532nm wavelength. There is no non-specific binding for the negative control spots. 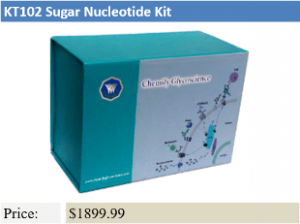 A positive control and the marker show binding as expected, as well as most N-glycans. WGA binds more strongly to N-glycans with terminal Neu5Ac. Example 1: A subarray assayed with glycan-binding protein biotinylated SNA lectin, followed by a streptavidin-Cy3 conjugate. 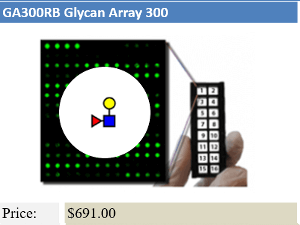 Array was scanned with a GenePix scanner at 500V PMT and 100% laser power at 532nm wavelength. There is no non-specific binding for the negative control spots. A positive control and the marker show binding as expected, as well as α-2,6 sialic acid-containing N-glycans. There is generally stronger binding to Neu5Gc sialic acids.